Please find attached agenda for the General Meeting to be held at the Roma Administration Centre on June 26, 2013 at 9.00am. To be held at the Roma Administration Centre on 10 July 2013. Mayor Cr. R S Loughnan chaired the meeting with Deputy Mayor Cr W S Wason, Cr. J L Chambers, Cr. R J Denton, Cr P J Flynn, Cr. W M Newman, Cr. C J O’Neil, Cr. M L Price, Cr. D J Schefe, Chief Executive Officer – Julie Reitano, Coordinator – Corporate Communications – Jane Frith, and Kelly Rogers Minutes Officer in attendance. Director Community & Commercial Services - Tony Klein, (Acting) Director Infrastructure Services – Michael Parker, Coordinator Planning - Danielle Pearn. The Deputy Mayor welcomed all present and declared the meeting open at 9.02am, noting that the Mayor was conducting an interview and would be a late arrival for the meeting. The Deputy Mayor then adjourned the meeting at 9.03am, to allow for Councillors to conduct introductions at the AgForce SEQ Regional Forum. Council resumed the meeting at 9.20am with the Mayor assuming the Chair. This pertains to Cr. O’Neil’s declaration of interest in Item LC.2 “Roma Saleyards Development –Marketing Sounding program (including Expression of Interest process)’, found on pages 7/8 and 10/11 of the minutes. The Financial Sustainability Report for the period to 31 May 2013 together with a summary of Council’s actual performance at sub program level against Council’s approved budget (as amended in March Review) was presented for Council’s consideration. · Status of the Road Infrastructure Agreements given the difference between budget and actual works undertaken. Post event report on Volunteer Week 2013 functions held across the Maranoa region. Council has received a request to provide a bitumen seal to Scotts Road in front of the homestead at 126 Scotts Road. That Council considers the inclusion of this project in future budget deliberations. Council has previously considered a report on the proposal to rent vacant land from the Qld Ambulance Service (QAS) in Roma for use as a carpark for the Roma CBD. Advice has now been received from the Queensland Ambulance Service as to the terms and conditions for rental of the site. · Term: three (3) years with one option for renewal of a further two years. Cr. Wason declared a potential perceived ‘Conflict of interest’ in the following item due to the request being put forward by a relative and elected to remain for discussion and debate on the item believing that this would not impact his ability to act in the public interest. Council had received a request to provide a bitumen seal to Binya Lane in front of the “Binya” homestead at 534 Binya Lane. Council has received a request from a resident of Miscamble Street, Roma to have kerb and channel installed in that street. The Lake Recreation Committee has requested consideration by Council, as Trustee of the Reserve for Recreation upon which the Lake is situated, of expanding the water impoundment area, increasing the height of the western earthen bank by approx. 1 metre, and creation of an artificial “beach” area on the north eastern side of the lake. 2. Note the interest of Cr. Peter Flynn to represent Council through participation in future discussions if required. The Department of Natural Resource and Mines has provided Council with an agreement to Offer conversion to freehold of Term Lease 219822 over Lot 1 on SP154291 being land used for the Surat Grain Depot. 2. Pay the amount in full by 10 July 2013. Cr. Wason declared a potential perceived ‘Conflict of Interest’ in the following item, due to the applicant being associated with a close family member and left the Chamber at 10.11am, taking no further part in discussion or debate on the matter. The application sought approval for a Material Change of Use to establish a “Warehouse” at 88 Spencer Street, Roma, described as Lot 15 on SP235497. The application is subject to Impact Assessment against the relevant provisions of the Roma Town Planning Scheme 2006. No submissions were received during the public notification period (15/04/2013 – 07/05/2013). 0101201 Rev B Sheet 1 of 13 as amended 3/06/2013. 10. Stormwater drainage for the development site shall be established in accordance with the Queensland Urban Drainage Manual (QUDM) (Volume 1 text, Volume 2 Design Charts), Australian Rainfall and Runoff (Volume 1 A guide to Flood Estimation) and CMDG – D5 Design Guidelines ‘Stormwater Drainage Design’. 11. Stormwater must not be allowed to pond on the property being developed during the development process and after the development has been completed unless the type and size of ponding has been agreed in writing by the Council or as a specific development approval condition. 12. Any increases in volume, concentration or velocity of stormwater from the property being developed must be channelled to lawful points of discharge or to other storage or dispersal arrangements which must all be agreed in writing by the Council. 15. The development is subject to the Filling and Excavation Code contained in section 5.2 of the Roma Town Planning Scheme. Earthworks are to be undertaken in accordance with the Soil Erosion and Sediment Control Engineering Guidelines for Queensland Construction Sites (IE Aust – or later versions). 16. All construction works on site to be undertaken in accordance with the Institute of Engineers (Australia) (IEAUST) Soil Erosion and Sediment Control Engineering Guidelines for Queensland Construction sites and the CMDG Design Guidelines – D7. 17. If there is a possibility of erosion or silt or other materials being washed off the property being developed during the development process, the developer must document and implement a management plan that prevents this from occurring. Erosion and sediment controls shall be maintained at all times during the course of the project. Should the proposed controls prove to be ineffective, the developer must install additional measures and provide written notice to Council advising of the additional control measures implemented. 19. Stockpiles of topsoil, sand, aggregate, spoil or other material capable of being moved by the action of running water shall be stored clear of drainage paths and be prevented from entering the road and/or drainage system. 20. Should it be necessary for the road and/or drainage system to be reinstated or cleaned up due to erosion and/or sedimentation from the site, then such works shall be undertaken at no cost to Council. Such works shall be undertaken immediately where there is a potential hazard to pedestrians and/or passing traffic. 21. In the event that Council receives a complaint relative to the quality of runoff from the site from a downstream property owner, the developer must take immediate steps to rectify the cause of any such substantiated complaint. The developer will also be required to meet the cost of any repair/clean up of downstream properties resulting from undesirable impacts of their works. 22. The developer shall immediately clean up and satisfactorily remove any deposited construction material or silt runoff from the development site. 23. The development shall be connected to Council’s reticulated water supply system in accordance with the Water Services Association of Australia (WSAA) publication WSA03-2002 Water Reticulation Code of Australia (version 2.3), and CMDG – D11 Design Guidelines ‘Water Reticulation’, at no cost to Council. 24. The development shall be connected to Council’s reticulated sewerage disposal system in accordance with the Water Services Association of Australia (WSAA) publication WSA02-2002 Sewerage Code of Australia (version 2.3), and CMDG – D12 Design Guidelines ‘Sewerage Reticulation’, at no cost to Council. 25. The development is to be connected to a reticulated electricity supply service in accordance with the relevant service provider’s requirements and specifications along with relevant building standards, requirements and specifications. 26. If the premises are connected to a telecommunications service, then such works shall be undertaken in accordance with the relevant service provider’s requirements and specifications along with relevant building standards, requirements and specifications (as relevant). 27. All services installation, including water, sewerage, electricity and telecommunications connections to the respective networks, must comply with (i) the development approval conditions, (ii) any relevant provisions in the planning scheme for the area, (iii) Council’s standard designs for such work where such designs exist (iv) the CMDG, (v) any relevant Australian Standard that applies to that type of work and (vi) any alternative specifications that Council has agreed to in writing and which the developer must ensure do not conflict with any requirements imposed by any applicable laws and standards. 28. Any conflicts associated with proposed and existing services shall be forwarded by the developer to the appropriate controlling authority for approval for any proposed changes. 29. The landowner shall be responsible for construction and maintenance of vehicle crossovers from the road carriageway to the property boundary and for obtaining any approvals that may be required and for complying with the applicable designs and standards. 30. Vehicle access from Spencer Street to the development site is to be constructed in accordance with plan CMDG-R-042 Rev B ‘Commercial Driveway Slab Type A – Two Way Access’ dated 12/2010. The vehicle crossovers must be constructed with a minimum width of seven (7) metres. 31. Vehicle crossovers to the proposed lots must be located a minimum distance of one metre from any street signage, power poles, street lights, manholes, stormwater gully pits or other Council assets. 32. Vehicles entering and exiting the development site must be able to enter and leave in forward direction. Reversing out of development site is not permitted. 33. All vehicle movements within the site are to be clear of proposed parking areas, buildings and landscape treatments. Vehicle parking bays must not encroach into swept paths for vehicle movements onsite. 34. A minimum of eight (8) vehicle parking spaces, including one (1) car parking space for persons with disabilities must be provided on site. 35. Provision must be made onsite for one (1) service vehicle parking space to cater for an articulated vehicle. 36. Parking bay configurations (width and lengths) to be in accordance with AS/NZS 2890.1:2004 Parking Facilities Part 1: Off-Street Car Parking. 37. Disabled car parking bays shall be designed in accordance with AS/NZS 2890.6:2009 Parking Facilities Part 1: Off-Street Car Parking. 38. Vehicle access and manoeuvring areas are to comply with AS/NZS 2890.1:2004 Parking facilities Part 1: Off-street car parking. 39. Service vehicle access and manoeuvring is to be designed in accordance with AS/NZS 2890.2:2004 - Parking facilities Part 2: Off-street commercial vehicle facilities requirements. 40. All car parking spaces, access and manoeuvring areas are to be sealed with an approved impervious surface. This surface shall extend the full width of the site from the front property boundary to the frontage of the building, excluding landscaped areas. Surfacing shall consist of either patterned concrete, reinforced concrete, concrete pavers, segmental clay pavers, asphaltic hotmix or two coat (primerseal/seal) bitumen seal. 41. No on-street parking is permitted at the frontage of the development site at any time. 42. All vehicular access and related items must comply with (i) the development approval conditions, (ii) any relevant provisions in the planning scheme for the area including Schedule 2: “Standards for Roads, Car Parking, Access and Manoeuvring Areas”, (iii) Council’s standard designs for such work where such designs exist, (iv) any relevant Australian Standard that applies to that type of work and (vi) the CMDG and (vii) any alternative specifications that Council has agreed to in writing and which the developer must ensure do not conflict with any requirements imposed by any applicable laws and standards. 43. Signage and line marking is to be in accordance with MUTCD requirements and AS/NZS 2890.1:1993 – Parking facilities Part 1: Off-street car parking. 44. Car park line marking is to be in accordance with AS/NZS 2890.1:1993 - Parking facilities Part 1: Off-street car parking. 45. Landscaping is to be provided with a minimum width of two (2) metres adjacent to the Spencer Street frontage of the site and adjacent to the building frontage in accordance with drawing 0101201 Rev A sheet 1 of 13 ”Site Plan” as amended, dated 20/02/2013. Vegetation is to comprise a mix of trees, shrubs and groundcovers. 46. Ground covers should fully cover vegetated areas within one year of planting. 47. Waste containers shall be placed in a screened area, accessible by the vehicles used by Council, its agents and/or others. At all times while the use continues, waste containers shall be maintained in a clean and tidy state and shall be emptied and the waste removed from the site on a regular basis. 48. Any proposed advertising signage is subject to a further development approval unless compliant with the self-assessable development provisions of the planning scheme. 49. Any free-standing advertising signage or structure to be constructed on site shall be designed by an RPEQ (Structural) Engineer and certification provided for both design and construction. 50. During and after the establishment of the approved development, no nuisance is to be caused to adjoining properties and occupiers by the way of smoke, dust, rubbish, contaminant, stormwater discharge or siltation at any time, including non-working hours. 51. There must not be unreasonable or sustained levels of noise or odour and no nuisance caused to adjoining properties during the course of the construction works and after the use commences. 52. Any air conditioning, generator, refrigeration, pump, exhaust, fans, or other equipment must be acoustically screened to ensure noise levels do not exceed 5dB above the background noise level. 53. Lighting of the site, including any security lighting, shall be such that the lighting intensity does not exceed 8.0 lux at a distance of 1.5 metres from the site at any property boundary. 54. All lighting shall be directed or shielded so as to ensure that no glare directly affects nearby properties. 55. The area and its surrounds shall be kept in an orderly fashion, free of rubbish and clear of weeds and long grasses. The approved development and the premises are to be maintained in a clean and tidy condition and not to pose any health and safety risks to the community. 56. Unless otherwise approved in writing by the Council, approved hours of construction are restricted to Monday – Saturday 6.00 am to 6.00 pm – noise permitted. Work or business which causes audible noise must not be conducted from or on the subject land outside the above times or on Sundays or Public Holidays. 57. An infrastructure contribution, in accordance with Council’s adopted Priority Infrastructure Plan, of $35,106.80 is payable to the Council. The stated charge is to be paid prior to commencement of the approved use. 58. All conditions of approval related to the establishment of the development must be fulfilled prior to any approved use commencing. 59. The developer is responsible for meeting all costs associated with the approved development unless there is specific agreement by other parties, including the Council, to meeting those costs. 60. All rates and charges of any description and all arrears of such rates and charges, together with interest outstanding thereon, on the land, due to Council, shall be paid to the Council prior to any use commencing on site. At cessation of discussion and debate on the abovementioned item, Cr. Wason entered the Chamber at 10.13am. That Council receive and note the Officer’s report to make a request to the Treasurer to allocate the land at less than the market value in the original offer made by Department of Natural Resources and Mines. Maranoa Regional Council is eligible to submit projects for funding under the Local Government Grants and Subsidies Program, administered by the Department of Local Government, Community Recovery and Resilience. The following projects have been identified as eligible, and have been prioritised from an operational and strategic perspective by the Executive Management Team and at a Council Workshop. As requested under the application requirements, the Mayor and the Chief Executive Officer will sign the Certification Form on behalf of Council, if Council endorses the priorities. The Community Development Team are in the process of creating a Capacity Building Model that will ensure the support and assistance they offer in the future is seen as relevant and therefore valued by the community whilst developing community capacity and promoting Council’s role in this area of operation. · Endorse a name change to the current position terminology of Coordinator - Community Development (town name) to Maranoa Community Coordinator. 3. Approve the attendance of the Mayor, (including associated travel and accommodation costs), in accepting an invitation issued by Santos CEO David Knox, at a Santos Networking Function in Brisbane on 22 June 2013. Subject Heading: name change to the Maruma-Li Mari program after further consultation with external stakeholders, including the adoption of an addition to the Corporate Style Guide. After external consultation the proposed name change from Maruma-Li Mari Family Violence Prevention Legal Service (MLMFVPLS) to Southern Queensland Indigenous Family Violence Legal Service (SQIFVLS) was deemed unacceptable by an external organisation due to the similarity with their registered business name. In consultation with the Maruma-Li Mari Community Advisory Committee the proposed name of Aboriginal Family Legal Service Southern Queensland has been proposed including logo and imagery. The name of the existing program Maruma-Li Mari be changed to the Aboriginal Family Legal Service Southern Queensland. 2. The additional logo and imagery for the Aboriginal Family Legal Service Southern Queensland be added to the Corporate Style Guide. Council’s approval was sought for the adoption of amended fees and charges for areas in Housing and Roma Saleyards to allow sufficient notice to be provided to affected clients. Council adjourned the meeting for morning tea at 10.27am. That Council close the meeting to the public at 11.15am. The Mayor declared a potential perceived ‘Conflict of Interest’ in item “C.5 Wall of Fame Inductees for Consideration,” due to him having personally put forward nominations under the program for Council’s consideration. The Mayor sought Council’s opinion on him remaining in the Chamber for participation in discussion on the item. Council indicating they were not opposed to him remaining for discussion. The Mayor elected to remain in the Chamber for initial discussion on the item, however foreshadowed that he would exclude himself for debate on the item when being debated by Council later during the meeting. Cr. Price declared a potential perceived ‘Conflict of Interest’ in item “C.6 Tender recommendation NDRRA 13/31 – Miscellaneous Roads”, due to her son’s partner being employed by one of the companies that put forward a tender for the project, and left the Chamber at 11.35am taking no further part in discussion on the item. At cessation of discussion on item “C.6 Tender recommendation NDRRA 13/31 – Miscellaneous Roads” Cr. Price entered the Chamber at 11.54am. Discussion again commenced on item “C.6 Tender recommendation NDRRA 13/31 – Miscellaneous Roads.” Cr. Price again declared a potential perceived ‘Conflict of Interest’ in the item and left the Chamber at 12.16pm, taking no further part in discussion on the item. At cessation of discussion on item “C.6 Tender recommendation NDRRA 13/31 – Miscellaneous Roads,” Cr. Price entered the Chamber at 12.18pm. Council adjourned the meeting for lunch at 12.30am. Councillors Price & Wason declared that she/he could have a potential perceived ‘Conflict of Interest’ in the following item as the matter under Council’s consideration was for applications received to install 2 grids. The matter was discussed at the meeting of Council and was not an ordinary business matter. Councillors Price & Wason declared that it could potentially be taken for there to be a perceived conflict between the personal interests of the Councillors and the public interest that might lead to a decision that is contrary to the public interest. The personal interest of the Councillors was that the Councillors could be a responsible person for a grid installed across a local government road, that is, a person who has the benefit of a grid installed across a local government road, and in particular, for Cr. Price with respect to a submitted application to remove and re-install an existing grid for location on Mount Hope Road Wallumbilla, which if approved by Council, Cr. Price may arguably be a responsible person, and for Cr. Wason with respect to two (2) grids located on Gerhardt Lane Roma, Cr. Wason may arguably be a responsible person for the purposes of Subordinate Local Law No. 4 (Local Government Controlled Areas, Facilities and Roads) 2011. Councillors Price & Wason dealt with the perceived conflict of interest by making a determination that her/his personal interest was not of sufficient significance that it would lead him/her to make a decision on the matter that would be contrary to the public interest and by informing the meeting that she/he honestly believed that she/he would best perform his/her responsibility of serving the overall public interest of the whole of Council’s local government area by participating in debate about the matter and voting on the matter. Council adjourned the meeting for brief recess 2.10pm. That Council open the meeting to the public at 2.30pm. Correspondence has been received from the applicant requesting Council give consideration to waiving the vacant water and vacant sewerage charges on a rates notice due to financial hardship in relation to assessment number 12004180. 2. Review the applicable concessions on an annual basis and incorporate any concessions granted into the Revenue Statement. Correspondence has been received from the applicant requesting discount be granted on payment that was received after the close of discount in relation to assessment number 12012175. That Council does not grant the discount in this instance as sufficient time of 30 days to pay the rates was provided to obtain the discount. An email was received from the applicant advising that payment of the notice was made after the close of discount as the applicant had received an amended notice dated 23 April 2013, in relation to assessment number 15011588. That Council grant the discount of $58.57 as payment was made within 30 days from the date of issue of the amended rates notice. Location: Glencoe Road, Access to Glencoe and Drysdale Ponds, through "Surprise"
Council has been involved in prolonged discussion with the owner of the property through which Glencoe Road traverses, concerning advice received from him via his Solicitors, that no further use by the public of Glencoe Road would be allowed. This advice was received via letter dated 29 June, 2011. The property is freehold land, and Glencoe Road is an existing constructed road with no evidence that a road dedication has been performed. That Council endorse the actions made by its Officers & Solicitors in reaching an agreement with the landowners, and approve that Council proceed with acquisition of the area comprising the “Glencoe Road” through “Surprise” and “Glencoe”. Further that advice be sought on the GST status of the transaction prior to finalising the compensation arrangements. The Mayor declared a potential perceived ‘Conflict of Interest’ in the following item, due to him having personally put forward nominations under the program and left the Chamber at 2.43pm taking no further part in debate on the item, with Deputy Mayor, Cr. Wason taking the Chair. Council considered received nominations for inclusion on the Wall of Fame at the Roma Recreation Centre. 1. Approve received nominations for inclusion on the “Wall of Fame”, those being – Mark Loane, Tanya Osborne and Emilee Cherry. The applicants met the criteria for selection having represented Australia in their chosen sport under the governing national sporting organisations for rugby union, rugby sevens and touch. 2. Media be initiated to inform the community of the program eligibility criteria and to raise the profile of the program. At cessation of discussion the Mayor entered the Chamber, assumed the Chair at 2.45pm. Cr. Price declared a ‘Conflict of Interest’ in the following item, due to her son’s partner being employed by one of the companies that put forward a tender for the project, and left the Chamber at 2.46pm taking no further part in discussion or debate on the item. This contract is for the restoration of flood damaged roads and associated infrastructure spread over the northern half of the shire, including most of the roads in the town of Injune. Tender invitations were forwarded to all six contractors on Council’s elected panel, resulting in four (4) proposals being received. These submissions were reviewed by an evaluation panel to allow a valid comparison to be made. Queensland Reconstruction Authority (QRA) have approved the scope of work and Council’s probity lawyers have reviewed the tender evaluation process for compliance with probity. That Council award the tender to Civil Contractors (Aust) for the sum of $5,451,041.82 + GST. That Council award the tender to NJ Contractors for the sum of $5,392,586.65 + GST, as it represents best value for money being the lowest priced conforming tender. No vote was taken on the motion at that time and at cessation of discussion on the item Cr. Price entered the Chamber at 2.57pm. On 13 February 2013, Council adopted a new Organisational Structure. Since that time there have been a number of minor changes required, and some turnover of staff. It is timely, prior to budget adoption, to provide an updated structure upon which the budget can be set. Individual names were included on the structure to facilitate internal communications, however, the Chief Executive Officer remains responsible for the appointment of staff (therefore the chart can be reprinted at any time to reflect the names of those currently in the various positions). That Council adopt the proposed Organisational Structure dated 12 June 2013 noting that in doing so Council is adopting the positions and reporting structures. That Council adopt the proposed Organisational Structure dated 12 June 2013, with an amendment that 5 positions be maintained for the Maranoa Community Coordinators, formerly known as Coordinator - Community Development (town name), noting that in doing so, Council is adopting the positions and reporting structures. That Council adopt the proposed Organisational Structure dated 12 June 2013, noting that in doing so, Council is adopting the positions and reporting structures. That a report be prepared for Council to consider the Organisational Structure for Parks & Gardens in relation to the towns within the region. For applications received where one (1) or more ‘Notice/s of Objection/s’ is/are received, the application be referred to Council for determination”. Council is now also in receipt of a letter from the Department of Natural Resources & Mines, received by e-mail at 4.20pm on Friday 7 June 2013. Mr & Mrs Shane Elliott presented a letter to the Councillors prior to commencement of the meeting for consideration during deliberations on this item. Note the receipt of two applications for grids on Marra Marra Road. Approve the installation of the 2nd grid on Marra Marra Road, provided the application is in accordance with Council’s Interim Gates & Grids Policy, to address immediate stock control issues between properties located on land described as RP 328 FTY 1860 and RP 65 BWR 518. Decline the application for the installation of a grid in the area located approximately 300m from the PEI Road / Marra Marra Road intersection (current location of the former Bendemere Shire Council grid). Advise the applicants that Council would look favourably on an amended application involving an alternative location that would facilitate the stockproofing of the roadway including and between the two gullies. After this time, the first grid on Marra Marra Road will be removed and Council will reserve its right to give a compliance notice requiring the installation, repair or replacement of fencing on the boundary between Marra Marra Road and the adjoining land. Further that Council encourage the Department to liaise directly with the applicants in relation to matters involving the Lessor and Lessee. The matter of the amended application be considered by Council at a future meeting. A traffic counter be established on the road so that Council can monitor traffic volumes on an ongoing basis. In a number of cases, residents elected to pay all rates and charges excluding the MPHS levy until additional information was received about the reasons for the levy. Since then, most of the ratepayers have paid but missed the initial discount period, and incurred a small amount of interest on the outstanding amount. That Council remit an amount equivalent to the lost discount totalling $2,487.38 to the ratepayers who have paid the MPHS levy and all other rates and charges and write off the total interest of $71. Cr. Price declared a ‘Conflict of Interest’ in the following item, due to her son’s partner being employed by one of the companies that put forward a tender for the project, and left the Chamber at 3.27pm taking no further part in discussion or debate on the item. No vote was taken on this item previously. Council again resumed discussion and debate. That Council award the tender to NJ Contractors for the sum of $5,392,586.65 + GST, as it represents best value for money being the lowest priced confirming tender. At cessation of discussion and debate on the abovementioned item, Cr. Price entered the Chamber at 3.36pm. There being no further business, the Mayor thanked Council for their attendance and declared the meeting closed at 3.41pm. These Minutes are to be confirmed at the next General Meeting of Council to be held on 26 June 2013, at Roma Administration Centre. 2. In accordance with Section 193 of Local Government Regulation 2012 adopt the 2013/14 Revenue Policy (Appendix A). The Revenue Policy states guidelines that will be used for preparing the Revenue Statement. The Local Government Act 2009 requires that the Revenue Policy must be reviewed annually. Council is required to adopt the policy in sufficient time before the start of the financial year to allow an annual budget that is consistent with the Revenue Policy to be adopted for the next financial year. The Revenue Policy provides guidelines in the preparation of the Revenue Statement. (c) the extent to which physical and social infrastructure costs for a new development are to be funded by charges for the development. The Revenue Policy applies to revenue raised by rates, utility charges, fees and charges. This policy applies to the making, levying, recovery and concessions for rates and utility charges and the setting of regulatory and commercial fees and charges for Council. Pensioner means a person who is the holder of a pensioner concession card issued by the department of the Commonwealth responsible for administering the Social Security Act 1991 (Cwlth) or the Veterans’ Entitlements Act 1986 (Cwlth). All other definitions are as per the Local Government Act 2009 and the Local Government Regulation 2012. In accordance with the provisions of the Local Government Act 2009 and Local Government Regulation 2012, Council is required to prepare and adopt by resolution a Revenue Policy. (d) Sustainability – to support the financial strategies for the delivery of infrastructure and services identified in Council’s short, medium and long term planning. General rates are set each year to assist Council in raising sufficient revenue to provide services to the community (exclusive of water, sewerage and cleansing/waste management utilities). Council recognises that different categories of land use will generate different needs and requirements for Council services and facilities. Council also recognises that it will incur a different level of resources expenditure to provide the necessary services and facilities and therefore has opted for a system of differential General Rating to meet its needs. (d) amount of the Unimproved Capital Value (UCV) and the rate payable. To ensure that owners of land across all differential categories contribute equitably to the cost of common services, Council will apply a minimum rate to each differential rating category. In general, Council will be guided by the principle of user pays in the making of charges that relate to the provision of water, sewerage and waste management services. Wherever possible, those receiving the benefits of a utility service will pay for the service received through the relevant utility charge. Council will annually review its utility charges and other fees for service to ensure that revenues are meeting intended program goals and are keeping pace with the cost of providing the service. Council may consider levying special and separate rates and charges when appropriate, to recover the costs associated with a particular service, project or facility that provides direct or additional benefit to the ratepayers or class of ratepayer. Consideration may be given by Council to granting a class concession in the event that all or part of the local government area is declared a natural disaster area by the State Government. In accordance with Section 120 (1) of the Local Government Regulation 2012, Council may grant a concession in 2013/2014 for the owner categories, or in some circumstances occupier categories, and properties used for the listed purposes. Eligible pensioners as defined in Schedule 8 of the Local Government Regulation 2012 may be granted a concession on general rates. In accordance with Section 120 (1) (b) of the Local Government Regulation 2012, a concession may be granted if Council is satisfied that the land is used for community purposes and is operated on a not-for-profit basis. The purpose of these concessions is to encourage and support certain not-for-profit and charitable organisations where the land use is considered to contribute to the health and well being of the community and the social enrichment of residents. Council may grant a concession where it can demonstrate that the payment of the rates or charges will cause extreme hardship to the land owner. Council will receive and consider applications from ratepayers where Council is satisfied that the application meets the eligibility criteria as provided for in Section 120(1) of the Local Government Regulation 2012. Applications for concessions under this section will be considered and determined by Council on a case by case basis. § Efficiency – by making the process used to recover outstanding rates and charges simple to administer and cost-effective. A cost recovery fee must not be more than the cost to Council of taking the action for which the fee is charged. Whilst Council notes that, pursuant to Section 97 of the Local Government Act 2009 it may introduce a tax component into a regulatory fee in order to achieve a social or other objective, it is not Council’s intention to encompass a tax in any regulatory fee. Accordingly, Council will not recover more than the cost of administering the regulatory regime. Council will apply, as a minimum and as far as practicable, the principle of full cost recovery (including overheads) in setting charges for services and facilities, including community or non-profit organisations. Council may give consideration to charging at less than the full cost of the service / facility when it considers it appropriate to do so in order to achieve social, economic or environmental goals. In making any such decision the reason for the decision will be clearly set out in the resolution, together with the estimated amount of revenue to be foregone in the subject year. When the service or facility supplied is of a commercial nature, then Council will give consideration to including a ‘return on investment’ element in the charge. Such consideration will be made on a case by case basis. (e) other competitive neutrality adjustments. Council may decide to apply charges at less than full cost pricing in order to achieve social, economic, environmental or other objective. In making any such decision the reason for the decision will be clearly set out in the resolution together with the estimated amount of revenue to be foregone in the subject year. When any such decision is applied to a Commercialised Business Unit, the direction to the Commercialised Business Unit will be recognised as a ‘community service obligation’ and a subsidy shall be paid to the Commercialised Business Unit and that subsidy shall be recognised in the accounts of the Commercialised Business Unit. To minimise the impact of physical and social infrastructure charges on the efficiency of the local economy Council will be guided by the principle of user pays in the making of physical and social infrastructure charges for new development, to the extent permissible by law. Council may depart from applying this principle if it is determined by Council that it is in the community interest to do so. The Revenue Policy shall be reviewed annually and in sufficient time to allow an annual budget that is consistent with the revenue policy to be adopted for the next financial year. A briefing paper for 2013-2014 Budget Parameters and timetable was presented to a Council workshop in March 2013. As outlined in the briefing paper, a 4% increase of the 2012/2013 fees and charges has been recommended. This increase is in line with the Local Government Association of Queensland Council Cost index of 3.3% and Council’s Enterprise Bargaining Agreement of 4%. Managers responsible for cost-recovery fees were advised to set fees so as to recover costs incurred by Council and that such fees should not exceed the actual cost incurred by Council for the action for which the fee is charged. For commercial fees and charges, these fees are to be calculated as cost plus “profit” including 10% Goods and Services Tax (GST). A detailed comparison of 2013-2014 general fees and commercial charges to 2012-2013 fees is provided in hard copy: Draft Register of Fees and Commercial Charges 2013-2014. A description of the Local Government Act 2009 provisions relating to fees and charges is provided in Attachment 1: Legislation. A letter dated 30 May 2013, received on 20 June 2013 from the Roma Livestock Agents Association Incorporated is also included by way of attachment with respect to the Saleyards: Attachment 2. 4. Delegate to the Chief Executive Officer the power to amend commercial charges to which section 262 (3) (c) of the Local Government Act 2009 applies. 5. Approve the omission of fees and charges for quarry materials and services in the Register of General cost-recovery fees and Commercial charges 2013- 2014. For the financial year 2013-2014, the price increase for General cost-recovery fees and Commercial charges has been set in line with the Council Cost Index developed by the Local Government Association of Queensland. Management has also considered the increase in line with Council’s Enterprise Bargaining Agreement and Officers’ Contracts of Employment. Accordingly, the price increase parameter for 2013-2014 fees and charges has been set to 4%. This increase will ensure fees and charges revenue is adjusted to recover cost increases over the 2013-2014 financial year. Where fees have increased by more than 4%, comments are provided in the Register of General fees and Commercial charges. The format of the proposed General fees and Commercial charges 2013-2014 has been amended to align with the approved Maranoa Regional Council Organisational Structure. For example, all fees and charges relating to Community and Commercial Services are grouped within this Directorate and are listed by Department. Legal advice was sought in relation to the requirement on Council to disclose quarry fees and charges in the Register of Fees and Charges. The advice indicated that Council is not obliged to disclose the price list unless Council’s business activity is classified as a “significant business activity” in accordance with Division 2 Section 43 of the Local Government Act 2009. The current threshold for a significant business activity is $25.54m and is based on the previous year operations. For 2012-2013, the projected operating costs for the quarry is $12.6M. The attached Proposed Register of General fees and Commercial charges reflect the policy implications of the commentary above. Revenue from fees and charges will form part of the Budget documents 2013-2014. (1) A local government may, under a local law or a resolution, fix a cost-recovery fee. (e) the performance of another responsibility imposed on the local government under the Building Act or the Plumbing and Drainage Act. (b) the time within which the fee must be paid. (4) A cost-recovery fee must not be more than the cost to the local government of taking the action for which the fee is charged. (b) if the local government decides, by resolution, that the purpose of the tax benefits its local government area. (6) The local law or resolution that fixes an application fee that includes a tax must state the amount, and the purpose, of the tax. (7) If an application fee that includes a tax is payable in relation to land, the tax applies only in relation to land that is rateable land. That Council approve the attendance of the Mayor at the LGAQ Disaster Management Summit on 9 - 10 July 2013 in Bowen Hills – Brisbane. This summit is an opportunity for the Mayor to find out more about the role of Emergency Services Queensland in responding to disasters, hear and discuss the experiences of a number of Councillor panel members whose regions were impacted by the 2013 natural disasters. The Maranoa Regional Council area has experience a series of flood events over the past 3 years and is well progressed in planning for the implementation of flood mitigation solutions in the regional centre of Roma, continuing the repair and restoration of regional roads damaged by flooding, as well as further investigating flood mitigation options in Mitchell and Amby. To seek support from Council to apply for an Animating Spaces Grant. That Council provided support for an Animating Spaces Grant application and that if funding is not forthcoming, that $10 000 can be included in first budget review for 2014 financial year. Arts Queensland is offering five communities across Queensland an opportunity for funding through the Animating Spaces Program. The Maranoa Regional Council would like to submit an Expression of Interest on behalf of the community to develop a unique art project for one town within the Maranoa Region (unfortunately the funding guidelines stipulate that only one town within the region can receive the grant and partake in the project). • $60,000 of funding and services to deliver three quality arts projects with workshops, exhibitions or performances, including honoraria for a community coordinator and three arts project coordinators, marketing services, payments for 2-4 artists per project, payments for local photographers, videographers and digital documenters. • A Regional Arts Development Officer to guide and support the delivery of three community-led arts projects. • Digital documentaries of the three arts projects and the community event. • An introductory two day community arts workshop for participants on arts and cultural project management. In return our community has to provide three (3) arts project ideas to animate three spaces and four part-time coordinators. Council will also need to provide evidence of support plus $10,000 of monetary support. This innovative, community-led arts initiative enables communities to strengthen their unique sense of place and identity, employ and mentor local artists, increase participation in the arts and develop an inclusive and resilient community in a state-wide project that revitalises places and spaces. Through the creative activation of three unique or significant spaces in one of our regional communities, Animating Spaces will culminate in a weekend of arts activity in 2014. Animating Spaces is an opportunity to develop a sustainable signature event that contributes to regional identity and pride, builds regional distinctiveness to enhance cultural tourism, strengthen the local arts industry and promote the value of arts and culture for regional renewal. As mentioned above, only one town within the Maranoa Region can receive the funding to run the arts projects. The decision as to which town will receive the funding will be made as part of community consultation meetings and with community input and feedback. Whilst only one town will partake in the project, the whole region will benefit from increased tourism and interest in the Maranoa as a result. $10,000 is required from the local community as part of the grant guidelines. This $10,000 has not been budgeted for in the 2013/2014 budget. If unsuccessful with funding applications and with Council’s approval, this could be included in the first 2013/2014 budget review. Council manage a large portfolio of properties across a number of different programs. This report outlines the maintenance process for Council Housing and includes relevant strategies to ensure the properties are inspected and maintained to an acceptable standard as per the Residential Tenancies and Rooming Accommodation Act 2008. Rural Housing Service Centre (RHSC) – 153 properties ( currently the LTCH properties are incorporated in the RHSC 2 year pilot which Council will no longer manage after 30/11/13. Maintenance for Council housing is assessed in a number of ways. When a property becomes vacant and exit inspection is completed and if required vacant maintenance is carried out on the property. Planned maintenance includes pest control, painting and refurbishments as per the asset management plan and budgets endorsed by Council. Responsive maintenance and repairs are those maintenance issues that occur throughout the year as identified by the tenant. During the signup Council Employees complete a tenancy agreement and are supplied with a tenancy pack. This process includes a Housing Officer providing information on tenancy specific requirements and a tenant signup checklist provides evidence that staff have explained the procedures to all tenants in Council Housing. The maintenance procedures and multiple maintenance forms are supplied as part of the signup. The process to report responsive maintenance issues is for the tenant to complete the maintenance form and send to Council’s housing staff. The nature of the maintenance request will dictate the process followed by Housing staff to rectify the issue as outlined in the Responsive Maintenance and Repairs Policy which was implemented in November 2011 and has been reviewed in June 2013. A recent internal audit has identified some areas of improvement. While some of these areas have been addressed in recent correspondence to tenants some additional strategies will be implemented to ensure that all housing properties are inspected and maintained to an acceptable standard as per the Residential Tenancies and Rooming Accommodation Act 2008. 1. An audit to be completed by the end of June 2013, of all Council housing properties to identify outstanding issues including annual pest control, annual property inspections and outstanding maintenance. 2. Review of the electronic property and tenancy management program “Console” to ensure staff are using all the features including the planned maintenance and inspection modules to assist with collating relevant data. 3. Review of the housing positions including the recent successful recruiting of two vacant positions to commence in early July. Corporate Plan 2009-2013 — 8.4.8(c) To effectively manage Council’s housing assets to an appropriate standard for the benefit of occupants. Budgetary consideration is required for 2013/14 financial year for commemorative celebrations of the 200th anniversary of the birth of Ludwig Leichhart in the form of a monument at Muckadilla that is to be created in consultation with the Muckadilla Community, Roma Tourism Association and Western Star. He took on three major explorations in the 1840’s before disappearing into remote Australia however his final communication was sent from Mt Abundance station near Muckadilla hence the choice of the location for this monument. This project can be incorporated into the existing Placemaking project for the Muckadilla town entrance signage and has already been discussed with the local community. Further consultation with the authors of this letter would also occur upon the endorsement of council. If not endorsed and supported by Council, we may be at risk of ignoring an opportunity to celebrate a historical event that is of importance to the Maranoa as well as an excellent tourism opportunity. Council has received a request for Gunnewin East Road to have culverts and cement floodways constructed in gullies. Council has received a request from Steve and Narelle Ward for Gunnewin East Road to have culverts and cement floodways constructed in gullies. Upon inspection of Gunnewin East Road sets of culverts were found to exist. However these pipes were silted up and the downstream sides blocked and the floodways had significant rutting. Cleaning out the existing pipes and clearing the downstream outlets will facilitate the removal of stormwater from the area. Furthermore, the entire road length needs a heavy formation grade. This work should be carried out via the road maintenance program. Laying gravel inverts in the floodways will decrease the instances of rutting and subsequent bogging of vehicles. Approximately 1km of gravel over 9 sites will be required. These works will benefit 6 residences. Capital Cost of $60,000.00 (for gravel invert) and an increase of $606.60 per annum in maintenance and renewal costs for capital upgrade of inverts only. Heavy formation maintenance grade of the entire length as part of the maintenance program will cost approximately $39,600.00. Maranoa Regional Council is a member of the South West Regional Road Group (SWRRG), and as such Council is required to formally endorse nominated Local Roads of Regional Significance within the Maranoa region. Maranoa Regional Council is a member of the South West Regional Road Group (SWRRG), and as such Council is required to formally endorse nominated Local Roads of Regional Significance (LRRS) within the Maranoa Region. 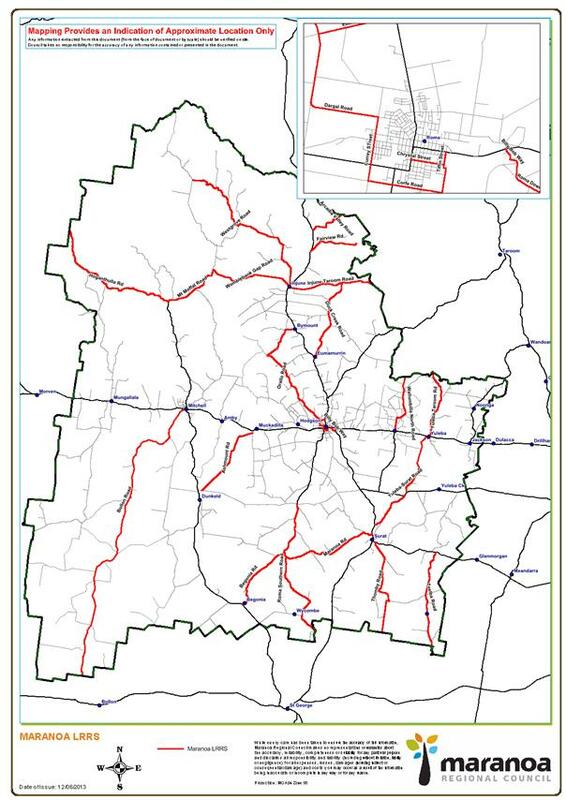 The table below shows the roads and lengths that are proposed as the LRRS within the Maranoa region. Projects on Local Roads of Regional Significance (that have been approved by the Regional Road Group) are eligible for funding through the Queensland Transport and Main Roads Transport Infrastructure Development Scheme (TIDS). This is a based upon a 50% contribution on Council’s part. Council periodically receives requests for dust seals in front of properties. Council’s formal adoption of the Dust Seal Policy will stream line the process. Council periodically receives requests for dust seals in front of properties. The formal adoption of The Dust Seal Policy draft by Council will stream line the process. The draft Dust Seal Policy provides the community with some opportunity to provide a partial voluntarily self-fund contribution to the dust sealing of roads adjacent to their property. It also provides property owners with the guidelines for the sealing of unsealed rural roads, under the care and control of Council, to minimise dust. This policy does not propose to substitute or offer an alternative to the requirements of Council’s Town Planning Schemes or development approvals. Adoption of this policy will streamline the process and provide direction to Elected Members, Council officers and the community. The approximate cost of a two coat seal is currently $11.11 / m2. Work on pavement would be in addition to the above cost. There are a number of properties within the Region where dwellings are situated in relatively close proximity to unsealed sections of roads and as a result of these circumstances, suffer considerable dust ingress. This policy allows Council to accept voluntary monetary contributions from residents to allow for the full or partial self-funding of dust sealing of unsealed (gravel) roads, subject to the rules and conditions contained within this policy. Wherever possible a dust seal shall be a 7 metre wide seal to maximize the benefit of the seal to the property owner and to minimize edge breaks and deterioration of the seal. The seal shall have a minimum length of 200m. This policy provides the community with some opportunity to voluntarily partially or wholly self-fund the dust sealing of roads adjacent to their property and provides property owners with the guidelines for the sealing of unsealed rural roads, under the care and control of Council, to minimise dust. This policy applies to all requests made to Council for the application of seals in front of residences in close proximity to unsealed rural roads under the care and control of Maranoa Regional Council. This policy does not relate to the sealing of driveways. This Policy applies to all community members. 1.1. Requests for the sealing of gravel roads are to be made to Council in writing. A responsible officer of Council will inspect the dust seal location and provide a report on the construction requirements and cost estimate to Council for a resolution. 1.2. The location of the dust seal is to be taken into account when reporting to Council. Consideration is to be given to the proximity to existing and future planned sealed sections and the difficulty and costs associated with maintenance and renewal of sections distant from other sealed sections. 1.3. Following the resolution, Council will formally respond to the applicant, advising of its consideration of the request, and if work is planned to proceed, the cost estimate of the works. 2.1. Council will assess the suitability of gravel road segments on a merit basis for suitability of the application of a dust seal. 2.2. The road is to be constructed to a standard that is consistent with the speed environment of the road where the seal is being applied. Wherever practical roads will be sealed to a width of 7m or that which is consistent with Council’s standards. d) That the seal width be the minimum required to cater for the expected traffic level. If the road does not meet all of these standards, then upgrade works shall be undertaken and recovered in accordance with section 3. 2.4. The seal is to have a minimum length of 200 metres. 2.5. Dust sealing of longer lengths of roads may be achieved by a group of residents cooperatively working together. 2.6. Council will manage the works. A contractor working directly for the property owner is not permitted. 3.2. Council may offer a subsidy of up to 50% of the total costs of the works with the actual percentage of subsidy to be determined on an annual basis as part of Council’s budget deliberations. 3.3. The value of total funds allocated to subsidise dust seal projects shall be determined on an annual basis as part of Council’s budget deliberations. 3.4. Council will provide a cost estimate for the works prior to commencement; however, the final costs of the works will be based on actual costs upon completion. 3.5. Council's cost estimate will be calculated using all appropriate overhead costs (i.e. on-costs) however Council will not seek a profit from the delivery of the dust seal. 3.6. Council will not accept any offer that is conditional on Council making a contribution exceeding 50%. 3.7. The priority decisions of Council's works program will be made without regard to the potential or otherwise of a contribution under this policy. 4.1. The voluntary, partially or wholly self-funded dust seal, if approved, will be included in Council's works program to suit resources and programming. 4.2. The voluntary, partially self-funded dust seal will not take priority over existing public works programs. 4.3. Sealing works are generally undertaken during the summer periods, when warmer weather is experienced. 5.1. Council accepts the voluntary partially or wholly self-funded dust seal contribution without any preferential maintenance commitment, or obligation, in favour of the completed dust seal works. 5.2. Council will take ownership of the completed dust seal works and manage the improved road asset in accordance with Council's existing programs and practices. All future maintenance work will be at Council’s expense except where damage can be attributed to the property owner. 5.3. The voluntary self-funded contributor will not have any authority or exercise any rights over the works by Council during or after construction. 5.4. Payment for cost of the works will be made prior to commencement of works and will be based on the cost estimate provided. Final costs shall be reconciled at completion of the works. Either party, as necessary, will adjust payment within 30 days of notification of final costs. 5.5. Prior to Council undertaking the work, it will be necessary for the landholder to sign and execute an agreement prepared by Council confirming the conditions and obligations of this policy. 5.6. Acceptance of a contribution does not imply acceptance by Council of the work as satisfying any existing or future condition of development consent. Council has received a request from W R Taylor for culverts to be installed on the corner of Creek Street and Short Street, Amby. The location was inspected and it was identified that a culvert at that location may improve the flow at that point. However, it is probable that this would negatively impact properties further downstream. It was also observed that the Warrego Highway is significantly higher than the surrounding properties. On the western side of Amby the Warrego Highway has several small culverts with obstructed outlets and no drainage under the carriageway was observed between Creek Street and Queen Street. Furthermore, the Railway line, which is also much higher than the surrounding properties, runs adjacent to the highway and only one set of culverts was observed. During the inspection Amby resident Ron Curry, of 19 Creek Street, gave his account of the flood behaviour in the area and produced photos from the 2012 flood event. The photos show the water level to be approximately 75mm below his floorboards. The BMT WBM Amby Flood Model Calibration Draft Report (2013) was reviewed and it seems that flow is restricted by the railway line and to a lesser extent the highway. A culvert at the corner of Creek and Short Streets would not resolve the overall issue of flood water damming within Amby, unless the drainage network is augmented to improve flow past both the highway and railway line. The construction of a levee bank could be another alternative however this option would be complicated due to the flow taking multiple paths. Further consultation with the Department of Transport and Main Roads, and Queensland Rail, as well as hydraulic model representing the new conditions if drainage was augmented would be required before any one solution could be recommended. Approximately 47 residences could be affected by flood mitigation infrastructure. Mr Neil Price has approached Council with concerns at to the level of liability resulting from a street known as Langton Avenue being constructed on a parcel of land owned by him. That Council provide direction as to preferred option and authorise Director – Infrastructure Services (Acting) to progress that option. Neil Price, the owner of Yuleba Hotel has approached Council with concerns as to liability arising from public use of Langton Avenue in Yuleba. Langton Avenue provides a link between Warrego Highway and Garden Street in Yuleba but is not contained within a road reserve. Langton Avenue is a 9 metre wide sealed roadway with kerb and channel on the full length on the eastern side and approximately 50 percent of the western side. There is anecdotal evidence that the area was originally sealed more than 25 years ago, possibly by the Department of Main Roads. d) a bridge, culvert, ferry, ford, punt, tunnel or viaduct. As the former Bendemere Shire Council appears to have maintained this area as a public roadway and improved it by constructing kerb and channel, Langton Avenue meets the requirements of the definition of a public road. Langton Avenue is a public, but not dedicated, road. Council has several options address the issues of liability, indemnity or dedication of this roadway. (1) A local government may close a road (permanently or temporarily) to traffic or particular traffic, if there is another road or route reasonably available for use by the traffic. (3) The local government must publish notice of the closing of the road, in the way that the local government considers appropriate (including on its website, for example). (4) The local government may do everything necessary to stop traffic using the road after it is closed. Perry Street, approximately 130 metres to the west of Langton Avenue, is the main access to the southern portion of Yuleba and may be considered as another road reasonably available for use by traffic if Langton Avenue is closed to the public. Council does not have a record of the number or type of vehicles using Langton Avenue but, as this road has been used by the residents of Yuleba for a considerable length of time, its closure may be seen in a less than positive way by the residents of Yuleba. Through discussion with Mr Price it has been determined that his preference is for Council to compensate him for the land under the roadway. In addition Mr Price feels that he is entitled to reimbursement for a portion of the general rates he has paid on this land in the years since he took ownership. It is to be noted that through a due diligence process Mr Price should have been aware of the road encroaching on this parcel of land prior to settlement of his purchase. He also advised that he would like Council to consider an arrangement whereby he is given a vacant parcel of land elsewhere in Yuleba, preferably in a flood free area, rather than a cash settlement. Representatives from the Department of Transport and Main Roads have advised that they do not have any objections to the establishment of a road reserve over Langton Avenue however have requested that truncations on the northern end of the reserve allow for vehicle movements onto the highway. This road is currently being maintained and renewed by Council. There will be costs associated with survey and potentially compensation should Council wish to establish a road reserve over this road. The Department of Transport and Main Roads has advised Council that it will require acquisition of parts of Lot 125 on Crown Plan DUB538 (Bore Reserve),Lot 128 on Crown Plan DL500 (Camping and Water Reserve), Lot 6 on crown Plan DUB538 (Unallocated State Land)The department requires Council to advise whether it has any objection to the resumption of this land. That Council advise the Department of Transport and Main Roads that Council does not object to the resumption of approximately 438.3 square metres from Lot 125 on Crown Plan DUB538, approximately 6502 square metres from Lot 128 on Crown Plan DL500, approximately 6830 square metres from Lot 6 on Crown Plan DUB538 for the purpose of road realignment. 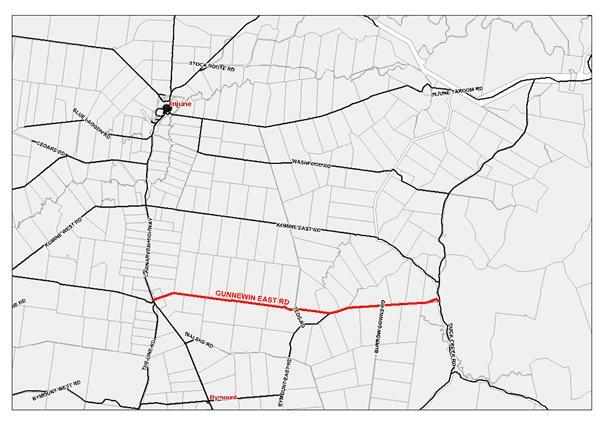 The Department of Transport and Main Roads has advised Council that it requires 6830 square metres from Lot 6 on Crown Plan DUB538, Parish of Mitchell, for the purpose on realigning the Warrego Highway (Mitchell – Morven) as shown on the attached maps. All cost incurred as a result of this transfer will be met by Department of Transport and Main Roads. and responsible management that enhances the rural industry. In January 2012 Council entered into a Commercial Tenancy Agreement with Queensland Blue Light Association Injune, Injune Youth Group and the Injune Swimming Club which allowed the groups use of the premises at 41-45 Hutton Street Injune. Blue Care Injune has from time to time shared in the use of the premises. The tenancy agreement expired on 18 January 2013. That Council enter into a Commercial Tenancy Agreement with Queensland Blue Light Association, Injune Youth Group, Injune Swimming Club and Injune Blue Care for a period of one (1) year with Council to pay all outgoings. Subject to the groups continuing a cooperative, shared use arrangement with other community organisations, no rent will be charged. In January 2012 Council entered into a Commercial Tenancy Agreement, for one year, with Queensland Blue Light Association Injune, Injune Youth Group and the Injune Swimming Club which allowed the groups use of the premises at 41-45 Hutton Street Injune being part of Lot 3 on RP171817. Christopher Mitchell, Officer in Charge Injune Police Station, made contact with Council with regards to all parties being interested in renewing the lease agreement on the same conditions as the previous year. Susan Harrison, Blue Care Injune, also contacted Council requesting use of office space in Injune for a period of one year. Blue Care Far South West has undergone a restructure and the closure of Maranoa Health Enhancement Program will mean a reduction in staff, as a result a large office space is not required. The agreement between council and the community organisations allowed the groups free use of the building with Council to pay all outgoings including rates, electricity, water and building insurance. Council has provided this space free of charge for Injune based community groups. Council is responsible for all outgoings. Blue Care Far South West has recently undergone a restructure and as a consequence of this and in conjunction with the finalisation of the Maranoa Health Enhancement Program funding we are writing to request the possibility of leasing office space within the Council Office of Injune. We would require this lease for a period of 12 months with an option of a more permanent and extended lease going forward. This office will be utilized by Blue Care staff for the purpose of carrying out our community services in Injune and surrounding areas and to accommodate our Family Support HUB worker. As Blue Care Community services are primarily carried out in the community there will be no direct client services from this premises. The HUB employee will, as part of business practice, see clients at this office. The closure of Maranoa Health Enhancement Program sees a significant reduction in staffing numbers which means we will no longer need access to a large office space. We also seek to continue our long running affiliation with Maranoa Regional Council and we will continue to work collaboratively to enhance the well being of the Injune and regions communities. Your attention to this request at your earliest convenience would be much appreciated as our current lease agreement ends in June 2013.